Are you heading to New York or planning a trip to February’s New York Fashion Week? Are you looking for a luxury hotel in NYC? 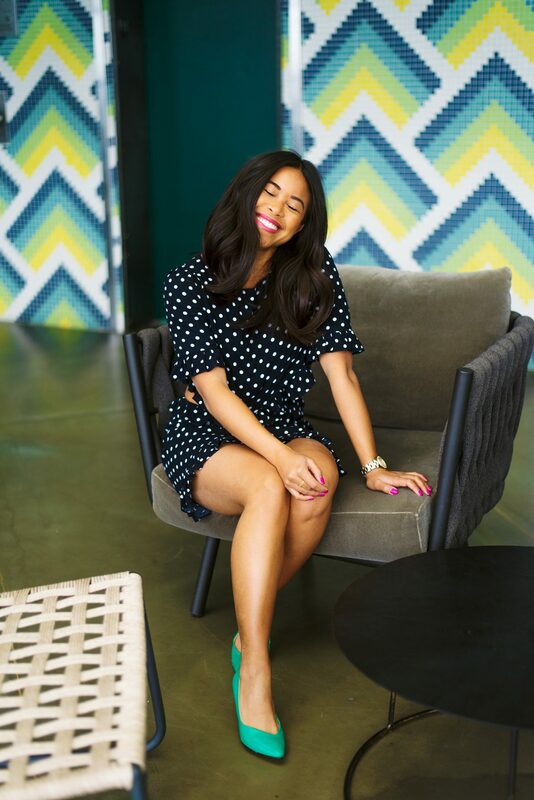 I recently attended my third New York Fashion Week and had the amazing opportunity to stay at the Gansevoort Hotel. Up until this month, the only thing I knew about the Gansevoort Hotel was that the Kardashians stayed at this hotel when they visited New York. 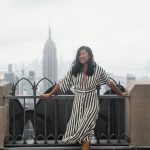 Here’s what I learned during my stay at the Gansevoort Hotel plus a few reasons to stay there next time you’re in the city! 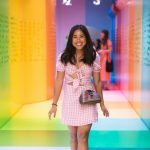 This blog post was made in collaboration with the Gansevoort Hotel and all my opinions are my own. What is the Gansevoort Hotel Meatpacking? In 2004, the Gansevoort Hotel Meatpacking opened as the first luxury and full service resort in the Meatpacking District. With 186 guest rooms, 22 suites, and incredible panoramic views of the city, the Gansevoort is a 5 star hotel in walking distance of Meatpacking, Chelsea, and West Village. 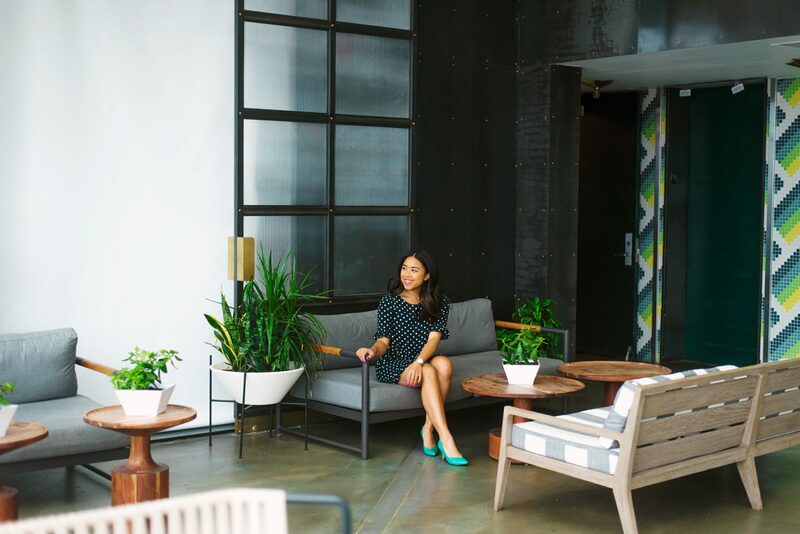 Whether you’re looking for a hair blowout, a spa treatment, a workout, or something to eat, the Gansevoort Hotel Meatpacking has got you covered. The hotel has a Glam & Go Salon, a gym, spa, a rooftop bar and fine dining restaurant all inside its walls. If you’re looking to explore the city, the hotel is in walking distance of the Chelsea Market, the High Line, and the Whitney Museum of Art. The shopping and dining options are endless around this area. Where is the Gansevoort Hotel – Meatpacking? 1. The Glam & Go Salon – Get the Blow Out! In addition to all the other amenities, the Gansevoort Hotel also had the Glam & Go salon. Whether you need a 15 min express blow out or want to be pampered with a classic wash/blow out service, the Glam & Go salon is amazing! I was so excited to get a blowout done before I attended shows! From the Glam & Go salon to the front desk, the Gansevoort Hotel staff was always professional and kind. I ended up coming to the hotel early for my Glam & Go hair appointment and the hotel was able to check me in early into my room! I always appreciate it when the hotel is able to check you in early or allow you to extend check out late. One of my favorite things about the Gansevoort Hotel Meatpacking is its location. I absolutely love the Chelsea/West Village neighborhoods because of the shopping, dining, and all the sights to see in these areas. The Gansevoort Hotel Meatpacking is literally a 5 min walk from the Chelsea Market – an amazing indoor food hall/shopping center. The Chelsea Market, formerly known as the National Biscuit Company’s factory, was converted as the market we know today in 1997. I try to stop by the Chelsea Market every time I’m in the city! So I couldn’t believe I could see the Chelsea Market outside of my window! The hotel is literally a 3 min walk to the High Line – a historic freight line that was transformed as one of New York City’s public parks. The High Line creates a space for tourists and locals to see art, enjoy some green space, and unique views of the city! The hotel was in walking distance of the fashion shows happening both in Industria and Pier 59! It was so nice being able to walk to the Oxford Shows, Indonesian Diversity, Fashion Palette and more. Typically I have to factor commute time from Brooklyn or East Village, so staying somewhere within walking distance was such a treat! 6. The Gansevoort Hotel Meatpacking has such comfortable beds! After a full day of photo shoots, meeting blogger friends, and exploring the city, I was so excited to come back to the hotel and lay in the bed! Both my friend/photographer Karya and I knocked out after adventurous days. The Gansevoort Hotel has probably one of the coolest hotel roof tops I’ve ever seen. It had a pool/lounge area, a rooftop bar, and plenty of indoor and outdoor seating areas. 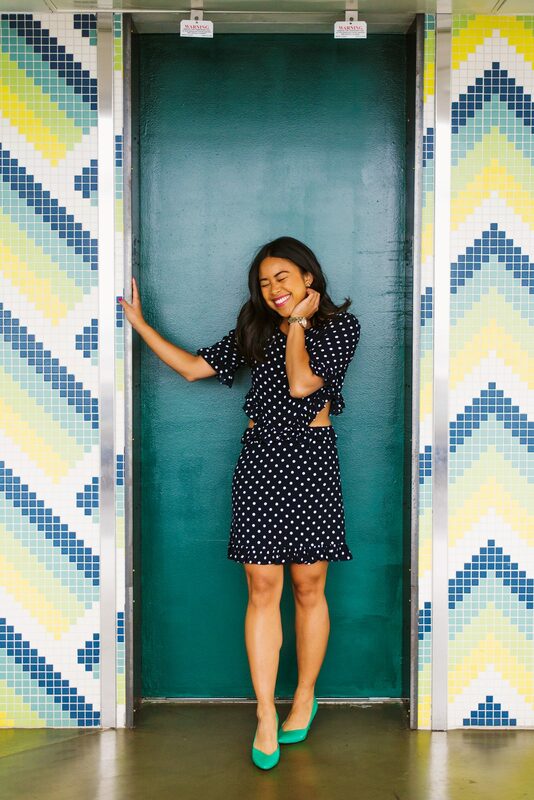 The roof top also had instagrammable spots – the tile, pool area, and wall paper/green couch location was picture perfect! If I get a chance to stay at the Gansevoort again, I would take a swim in the pool and grab a drink at night to enjoy the city views! Thank you again to the Gansevoort Hotel for inviting me to stay with you during New York Fashion Week! You made my fashion week experience enjoyable!